The aftermath of the Rio Earth summit and of the Kyoto Convention have shown the difficulty faced by many governments in coming to grips with global environmental issues. The merit of these high-profile events however is that they have created a new consciousness among business, industry and consumers of many positive steps that they can themselves take with or without a strict regulatory framework. International standards have for many decades been a primary tool in resolving such issues. They address the quality, safety, produceability and many other aspects of an ever-growing array of products, processes and services as technological and industrial development accelerates around the world. They are based on international consensus. By offering globally applicable solutions, they are cost-effective and allow all to take advantage of the knowledge and experience gained in the more advanced economies. Perhaps most importantly in dealing with environmental issues, they are for voluntary adoption by anyone from a single individual to a government or group of governments, which means that they can be used and acted upon before legal requirements are introduced. The three apex international organizations that lead the development and dissemination of these standards and recommendations are the International Organization for Standardization (ISO), the International Electrotechnical Commission (IEC) and the International Telecommunication Union (ITU). By their nature, by necessity and by design, these organizations and their publications are in the front line of efforts to meet perhaps the greatest and certainly one of the most public challenges of the new century – our environment, how to protect it, how to manage it better. In much of the industrialized world, management of environmental issues has become as much a cornerstone of business practice as health, safety and quality. But it is self-evident that not all countries have the resources of the industrialized world. Environmental aspects of standards are significantly different in at least one respect from other broad-ranging subjects of international standardization such as quality. 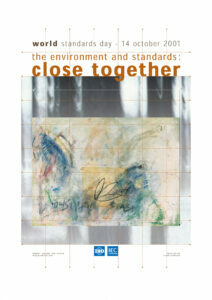 The basic arguments for environmental considerations in standards are the same as those for sustainable development. The environmental aspects of standardization are in fact a component of sustainable development. ISO, the IEC and ITU also have an important responsibility as well as an active role in helping developing and newly industrialized countries to become environmentally conscious while contributing to make their own future economically and environmentally stable. Whether it is in management, product, systems, process, measurement or testing standards – or indeed by facilitating sustainable development through the spread of standardized telecommunications – each organization has its part to play and each works with a host of others to have the widest possible consensus as well as the most globally beneficial effect. Having more than 30 years of active involvement with the issues, ISO, the IEC and ITU have a three-dimensional approach to the environmental aspects of standardization. Hundreds of standards already exist, for example, dealing with specific questions such as the sampling, testing and analysis of air, water and soil. Thousands more covering a multitude of physical products, increasingly in the electrical, electronic and telecommunication spheres, already contain information and recommendations on environmental aspects like materials, industrial processes, recycling and waste disposal. Many of these will also have an important role in current efforts to help consumers with standardized, clear and easily understood eco-labelling. At the strategic level, international standards on environmental management offer a structure, a methodology and practical tools to help organizations of all types to manage the impact of their activities on the environment. All these standards are available for industry to use in environmentally conscious design and manufacture, in effect to regulate itself as regards the environment. In the area of telecommunications, standardized systems enable scientists around the world to collect, analyze and disseminate data on climate change, on the state of our waters or underground resources, providing the authoritative indicators by which remedial solutions can be elaborated and implemented to protect our environment. and responsible way in which ISO, the IEC and ITU are addressing environmental issues that affect us all will have a growing impact on society’s response to meeting its own expectations. The environment and international standards are perhaps more than just close together. For the foreseeable future, they are inextricably linked.